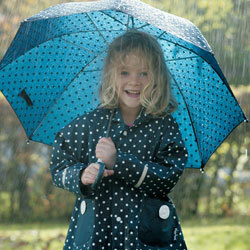 Children's Rainwear Brands from Waterproof World - Great for Outdoor Play! Danish brand Ocean has more than 50 years experience in bringing quality rainwear to the Scandinavian market, so we are delighted to introduce their children's wear range to the Uk. range. The waterproof two piece rainsets, jackets, trousers and dungarees are tested as waterproof to 8000mm and are windproof and breathable. Ocean also manufacturers natural rubber wellies. Ocean has achieved the stringent Oekotex certification, guaranteeing that products bearing the label are manufactured using only ecologically safe substances. Waterproof World has carefully selected Regatta as one of its brands for children's waterproof clothing. Regatta is a UK leader for high performance, style and value for money outdoor wear. Waterproof World stocks the widest range in childrens sizes for Regatta jackets, trousers, fleeces and all in ones, from 6 months to teenage. Our special favourites are their practical packaway range of lightweight jackets and trousers, which can be scrunched into their own pack sacks. Dare 2b is the skiwear brand from manufacturing giant Regatta. Offering their usual blend of quality, style and great price, it is ideal for children, allowing them to be kitted out for the slopes in great technical gear at unbeatable family prices. In our view, Togz Wellie Weather suits are the best all in one suits on the market. 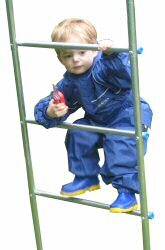 They are made by UK company PlayTogs, winners of Practical Parenting's best buy award for children's waterproofs (Oct2004). The suits are generously cut, very waterproof, windproof and breathable. A fantastic option for winter are the Togz Warm and Dry suits. Like the wellie weather on the outside, they have a snug fleece lining. As well as the suits, jackets and dungarees are available in the Warm & Dry range. Also, great for winter are the warm & dry jackets and dungarees, offering snug 2 piece sets, waterproof, breathable and thermally lined. We are pleased to offer you splashsuits, winter wear and accessories from major Scottish brand Trespass. Trespass offer a wide range of stylish and high performance outerwear and ski-wear, as well as great winter accessories -and all at accessible prices. Our latest find from Europe. As with our existing Scandinavian suppliers, ecologically safe fabrics are a priority for Playshoes. Using the soft eco-friendly PU fabric so popular with Waterproof World customers, we are delighted to introduce the Playshoes co-ordinating collections of jackets & , ponchos; as well as rain boots and umbrellas, with great choice for big and little girls and boys. Waterproof World introduced high performance Kiba Rainwear to the UK from its home country of Denmark. Whilst Kiba has proved a very popular line with our customers, sadly the company was a victim of the credit crunch, so we are not able to supply this brand any more. As the closest alternative, we recommend the Ocean Rainwear range as its range of soft, 100% waterproof, windproof jackets, dungarees, trousers and 2 piece suits and wellies are favourites for really comfortable outdoor play.